P.s. Vintage and Main is celebrating My Paradissi as an Etsy Tastemaker and is giving a 10% discount with code ATASTEOFVINTAGE10 to selected stores for a few more days. See the list of participating stores here. 10 comments on "ETSY MIX of the week"
I love them all! I am totally obsessing over that nightstand. It would look perfect in my room. There are alot of great vintage MCM finds in the Shops at Vintage and Main. Thank you so very much for the mention. Perfect picks, classic, sleek and organic. What could be better! And thank you for the VintageAndMain mention! Elegant and simple. So great! Beautiful classic selection!!! And thanks so much for the Vintage and Main mention!!! Excellent mix! Love your choices! Oh, and thank you for the Shout Out for the Vintage & Main Collective of shops on Etsy! Beautiful pairing of vintage and handmade items, you have a lovely sense of style. 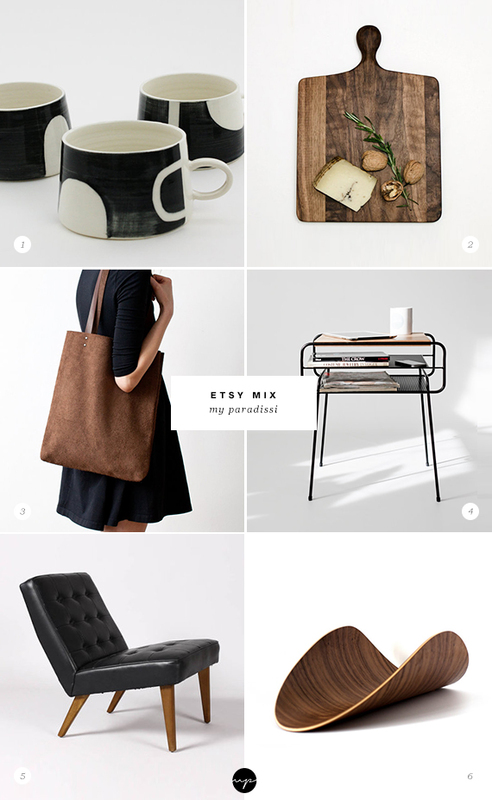 Added your fabulous design blog to my favs! Keep up the good work.